MustRead Special: Kindle Unlimited Membership Plans - Over 1 Million books at your fingertips! Two Washington County commissioners known for their hardline stances aimed at local development formed a candidate slate in September, naming a Tea Party Republican and anti-development activist as treasurer of their slate. Susanne Donaldson, a Williamsport resident and local Tea Party activist, signed on as treasurer. Commissioners Baker and Keefer and Susanne Donaldson did not respond to A Miner Detail’s request for comment when reached by email. Baker of Clear Spring and Keefer of Hancock have formed a commissioner voting bloc alongside embattled Washington County Commissioner LeRoy E. Myers Jr., who is not seeking re-election to a second term. Former Washington County Assistant County Administrator Sarah Lankford-Sprecher accused Myers of sexual harassment last year, stemming from an October 2016 South Korean business trip. 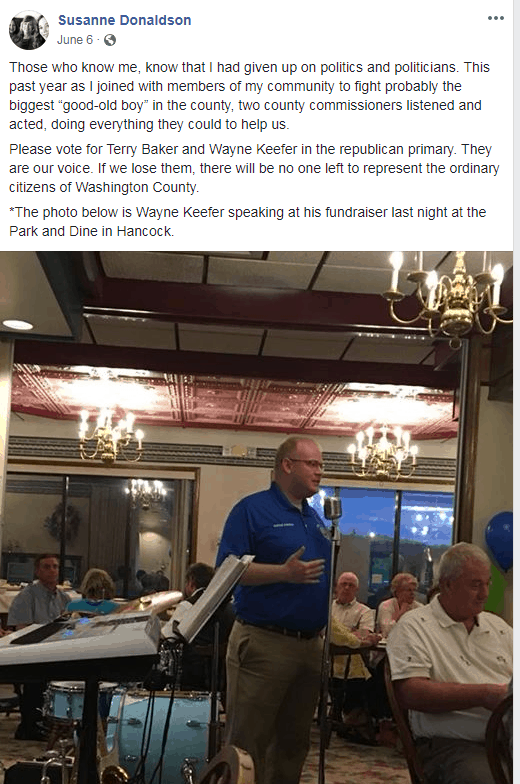 Keefer, 32, was chosen by the Washington County Republican Central Committee in March 2016 to fill the commissioner seat left vacant following the resignation of the late Vincent G. “Woody” Spong. Spong resigned in January 2016, one day before he was set to be considered by Maryland’s Senate Executive Nominations Committee. Gov. Larry Hogan’s Appointments Secretary Dennis R. Schrader signed a letter to the nominations committee opposing Spong’s appointment on behalf of Hogan and his administration after Spong shared a racist Facebook meme to his personal Facebook page and made inappropriate comments to a former female school board member. Spong, who died last year of cancer, was boosted by Baker during the application process with Washington County’s Republican Central Committee. Baker and Spong were longtime friends. Susanne Donaldson in 2016 took to Facebook to defend Spong and launched specious attacks against Washington County Democrats, developers and other Republican county commissioners. An ardent foe of local development, Donaldson has previously lashed out at Donald Bowman, the president and chairman of Bowman Group LLC and Herald-Mail Media’s 2017 Person of the Year. One of Baker and Keefer’s Republican opponents who asked not to be named in this story texted A Miner Detail after learning that Baker and Keefer appointed Donaldson as their slate’s treasurer. Donaldson also has a history of engaging in alt-right conspiracy theories and Alex Jones-style attacks, weaponizing her personal Facebook page as a running indictment on whom she believes as the “good ol’ boy network,” including Washington County Commissioner Jeff Cline and state Del. William J. Wivell (R-Washington). The Baker-Keefer candidate slate is holding a “Free Event” on Sunday, Oct. 21, at the Maugansville Ruritan Club, featuring food and live music. Early voting in Maryland begins on Oct. 25. The general election will be held on Tuesday, Nov. 6. The post Baker, Keefer form candidate slate; anti-development Tea Party Republican named as treasurer appeared first on A Miner Detail . MustRead.US features well crafted and carefully researched reporting and editorials from dozens of stellar writer/contributors who enjoy a wide variety of political, economic and social backgrounds. We also feature original book and product reviews and expert columns from trusted authorities, professionals and industry leaders across the nation. MustRead.US encourages and fosters vibrant, lively and intelligent comment threads. Our users engage each other on complex topics, share essays and ideas, ask questions, and express concerns. We want to inform, educate, surprise and entertain.